The fallout from Quebec's corruption scandals has reached the epicentre of Canada's Parliament, with the federal Opposition leader revealing Thursday he once spoke to police about someone trying to pass him a suspicious-looking envelope. NDP Leader Tom Mulcair said he spoke to investigators two years ago about a 1994 meeting with the then-mayor of Laval, Que., who has since resigned in scandal and been slapped with criminal charges. A newspaper report Thursday said Mulcair was offered — and refused — an envelope he believed to have contained cash. There have been several reports over the years about Laval's ex-mayor Gilles Vaillancourt offering provincial politicians such envelopes — and he now faces gangsterism charges for directing a criminal organization. Police say that for years the municipality across the river from Montreal was run like a criminal network where officials siphoned off cash from public contracts. Vaillancourt had denied the reports of cash envelopes in the past, and he denies the criminal accusations now. Mulcair issued a statement Thursday that said little about the report in Montreal La Presse. All it said was that he shared details in 2011 with police "in order to help with their investigation." His statement added that he immediately ended that 1994 meeting with Vaillancourt. "This matter is currently before the courts and I will therefore avoid further comment," Mulcair said in the statement. His office said he would not be available to answer media questions Thursday — such as why he waited 17 years to come forward, and two more to make it public. The governing party certainly wasn't giving Mulcair the benefit of the doubt. A statement from House Leader Peter Van Loan accused Mulcair of remaining silent about corruption for two decades. It also accused him of lying during a 2010 press conference, when he said he had never been offered a bribe during his time in Quebec politics. "Why did it take a public inquiry into the biggest corruption scandal in Canadian history for Thomas Mulcair to finally come clean with Canadians?" said Van Loan's statement. "Will he agree to appear if called to testify under oath before the Charbonneau commission?" The statement accused Mulcair of selectively leaking the information out Thursday — when public attention might be distracted by "other stories." Van Loan did not point out what stories he was referring to although, in Ottawa, the government has been embroiled in controversy over Sen. Mike Duffy's expense claims and the role of the Prime Minister's Office in helping to clean them up. It's unclear whether Mulcair was in fact lying on Nov. 16, 2010, when a journalist asked at an Ottawa press conference whether he had ever been offered cash envelopes by Vaillancourt and he said: "No." 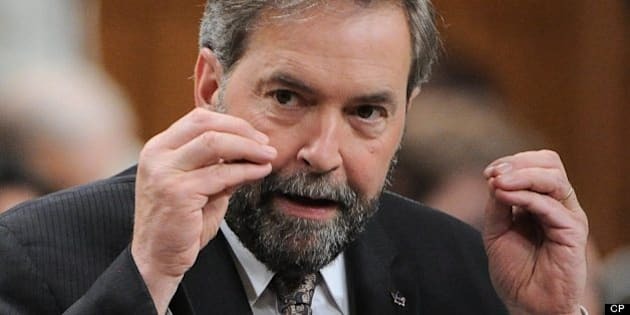 The report in La Presse said Mulcair told police he'd actually left the 1994 meeting without opening, or accepting, a white envelope and did not know for sure that there was cash inside. At the time of the meeting, Mulcair was a rookie provincial politician representing a Laval riding and Vaillancourt was a powerful mayor in the early stages of his six-term career. The inner workings of Vaillancourt's city hall are just now coming up for scrutiny at Quebec's corruption inquiry. The far-reaching political implications are hinted at in the La Presse report, which points to a quote in a magazine article attributed to ex-premier Jean Charest. Mulcair is quoted telling L'Actualite magazine in 2011 that his personal problems with Charest began when he wanted to legislate to protect wetlands in Laval against Vaillancourt's will. He tells the magazine that the premier responded that the government couldn't do such a thing to Vaillancourt — because, according to the words Mulcair attributed to Charest, he said he needed Vaillancourt's help in elections. One thing the Quebec inquiry will not touch is federal politics. In fact, inquiry chair France Charbonneau specifically stepped in today to warn a witness to steer clear of any talk about federal parties or contracts. Federal politics or contracts are outside the mandate of the provincial probe, charged with exploring illegal municipal and provincial party financing, corruption and Mafia ties in the provincial construction industry. A Laval city official and former engineering executive, Jean Roberge, is currently on the stand discussing gifts given to officials outside Laval. He had mentioned his firm received federal contracts. "I don't want you to talk about the federal government," Charbonneau told Roberge. Roberge testified Thursday that over a decade, he took part in collusion as an engineering-firm executive, and later ran the corrupt system at Laval's city hall before ultimately becoming one of those tasked with cleaning it up. There was no question who was in charge, he said. Engineering firm officials spoke of former mayor Vaillancourt as "the boss," and the one who signed off on the most lucrative contracts. Roberge explained that company reps would tell him it was their "turn" to get a contract and the "boss" had confirmed they were going to win. Roberge said he later verified with the mayor and would be given a nod or a sign that Vaillancourt had in fact promised contracts to certain firms. Roberge had earlier admitted to taking part in collusion between 2002 and 2007 while he worked with the Equation firm. He said he paid $18,000 through a notary, with the cash destined for Vaillancourt's party. He said construction collusion continued until late 2009. Roberge said that once he became deputy city manager, he began the process of dismantling engineering-firm corruption, and it was over by early 2010. The increased media scrutiny and the arrival of an anti-corruption police squad — Operation Hammer — led to the end of the illicit practice. Roberge admitted his role at the city was ambiguous, given that he was seeking to root out corruption on the one hand while having helped make it happen on the other.